Yes, we did say you can pretty much put K.O. Ketchup on anything and we stand by that. But here we’ve rallied our experts to hone in on a few of the most awesome combinations that really tend to turn your meal into a party. In a saucepan, combine K.O.Ketchup, 1 tablespoon sugar, olive oil, rosemary and thyme. Stir the mixture and gently bring to a boil for about 2 minutes. 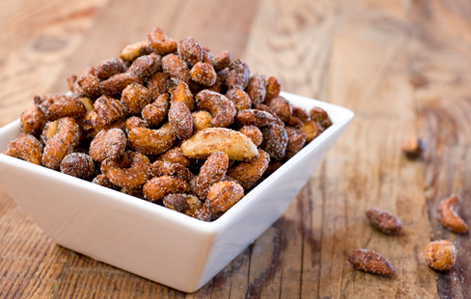 Stir in raw mixed nuts until all the nuts are coated with K.O., remove from heat. Pour coated nuts into a lightly greased sheet pan. Bake for about 10 to 12 minutes stirring it every 5 minutes until almost dry. Remove from the oven and toss in the remaining 1 tablespoon sugar. Heat a cast iron dutch oven pan. Season the tri-tip well with salt and pepper. Sear the meat very well on all sides. In a large bowl, mix the beer, K.O. Ketchup, Worcestershire sauce, and garlic. Add to the pot with the seared tiptip. Add sliced onions and bay leaves to the pot. 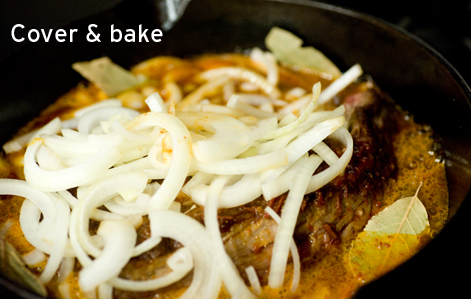 Make sure most of the onions are on top of the meat when baking. Cover and bake for 1 and a half hours. Open the pot, flip the meat and redistribute onions. In a large saute pan heat the oil. Add the sliced onions, peppers and garlic and cook over medium heat until everything is soft, about 20-30 minutes. You may need to add the water a couple tablespoons at a time to keep it from drying out. Add the tomatoes and espelette and cook another 10 minutes until they have broken down and the peperonata is done. It should be slightly saucy and the vegetables should be soft. Remove the triptip from the oven, take the meat out and let cool/rest for 15 minutes. Remove the bay leaves from the sauce, transfer to a blender and blend until smooth. Adjust seasoning. It should be thick. Slice the tritip AGAINST the grain into thin slices, like you would a brisket or flank steak. 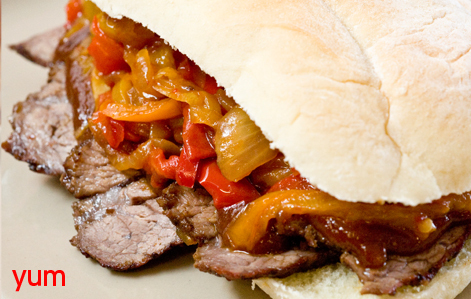 Distribute the meat onto the rolls, top with the sauce and peperonata and serve warm. Perfect for game day or sunday BBQs! What happened to the lost art of the tostada? Used to love them as a kid, but since then we’ve noticed underwhelming support of this tasty taco plate at gatherings and dinner parties, alike. Is it, perhaps, because people grew tired of the inconvenience of eating it (a taco is much easier to grasp by hand)? Or has the nacho (essentially a broken up tostada) simply become the dominate game day snack? Or, rather, have people simply become bored with the basic flavors? Whatever be the drawbacks, we’re making moves to rejuvenate the tostada with a KO Ketchup kick. Remix the snack stand at your next game day and offer these mini tostadas. Easy to eat, packed with flavor, and a truly novel game day snack food. If you are making the tostada shells heat a wide heavy bottomed saute pan on medium heat. Add the oil and heat to 350 degrees F., about 3-4 minutes over med high heat. Test one tortilla by dipping the corner in to see if it begins to fry. If nothing happens your oil is not hot enough. If it begins to spit and bubble like crazy turn the heat down and wait a minute or two. Fry the tortillas in batches so that they cook evenly. Flip to crisp each side and don’t overcrowd the pan. Transfer the crispy shells to a paper towel lined sheet pan and season with salt. Repeat until you have 12 shells. In another heavy bottomed saute pan heat the olive oil. Saute the diced peppers and onion until soft but not browned. Add the meat and break it up as it cooks with a wooden spoon or spatula until it is in very small pieces. Once it is cooked add the taco seasoning and KO. Cook another 5 minutes, add the corn and cook 5 more minutes. Use three shells per plate and top each with the seasoned meat. 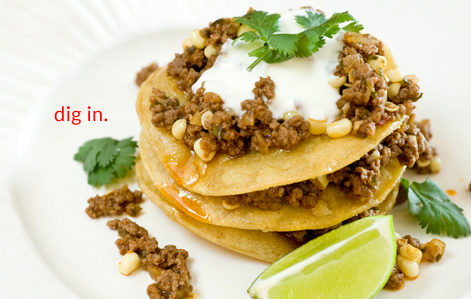 You can serve them stacked or like three open faced tostadas. Garnish with the sour cream, lime wedge and cilantro.